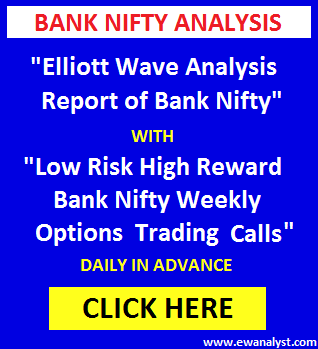 Bank Nifty opened lower at 25066, registered high 25077 and declined back by more than 250 points to register low 24813 and finally closed 273 points down at 24851. Yesterday, bounce towards 25217-25400 was expected and I also mentioned that if Bank Nifty will open below 25124 then it can decline further towards 25034. I also suggested Bank Nifty if decline near 24878 then risk can be taken again by Initiating longs using stoploss of 24877 expecting targets of 300-500 points which further can extend for new high. 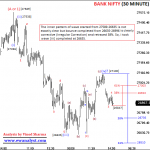 Bank Nifty opened lower at 25066 (below 25124) and further declined till 24813 and finally closed at 24851. Stoploss of 24877 was triggered. Now, we need to analyze latest charts for next move. 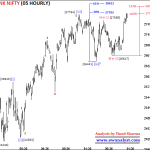 This is 5 Hourly time bar chart of Bank Nifty covering move from low 23611. 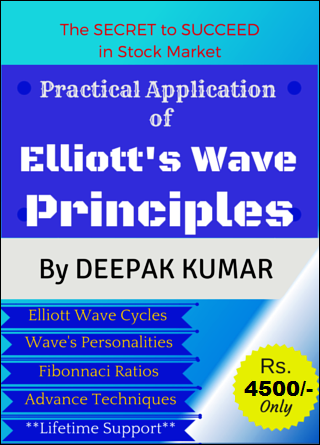 It seems wave completed from 25953-25797 may be wave (i), wave completed from 25797-25873 may be wave (ii), wave completed from 25873-24947 may be wave (iii), wave completed from 24947-25217 may be wave (iv) as Irregular Correction and wave (v) may be in progress from 25217. 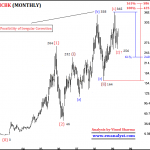 Wave (v) already achieved its 38% projection placed at 24832 where as 61% placed at 24595 which may or may not achieve. 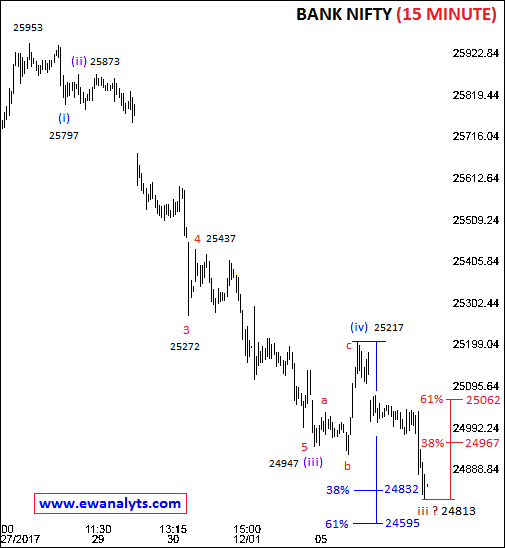 38% retracement of progress of wave (v) is placed at 24967 which is the immediate breakeven point on upside above which we can think about further bounce. 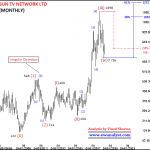 And medium term breakeven point is 25217 (start of wave (v)). 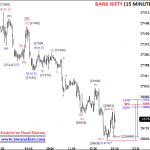 Outlook of Bank Nifty is still negative as long as trading below 24967. And on downside, the wave started from 25953 already achieved its minimum requirements after breaking below 24832 and next possible level is 24595. 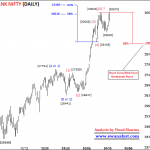 Generally, Bank Nifty if breaks above 24967 can bounce further towards 25217 and above. And 24595 is the general point from where a small or big bounce can be expected. 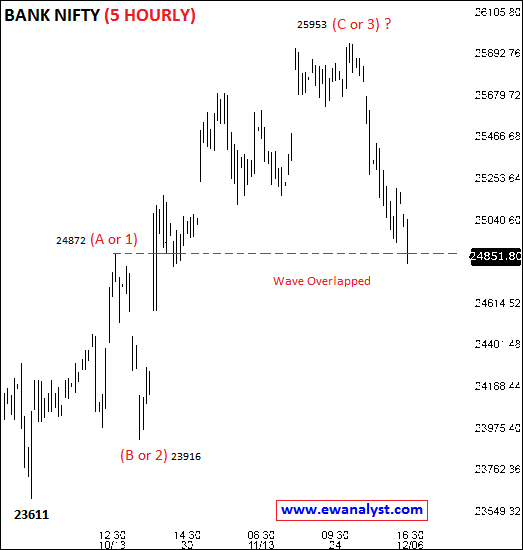 Otherwise there is no sign of reversal because Bank Nifty closed near low of the day. 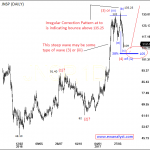 It is very difficult to plan trades in these conditions because Option Premium is very high and stoploss is very big. But still if some wants to trade can trade with these conditions. 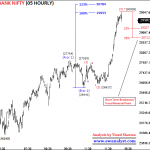 Bank Nifty if breaks above 24967 then 24900 Call can be bought using stoploss of 24867 expecting minimum target 25200. Bank Nifty if decline towards 24600 then hedge trade can be initiate by “Buying Bank Nifty Dec Future and Selling 28 Dec 24600 Call” in equal quantity with stoploss below 24400. Safe traders can wait for low risk trading opportunity.